At Worthy.com you can sell your Omega watch effortlessly without even having to leave your home. 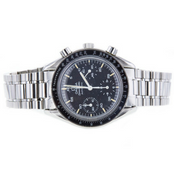 We specialize in evaluating pre-owned luxury items and selling them on our signature auction platform, where hundreds of professional watch buyers submit fair, high market value bids for you Omega watch. Worthy connects you to a wide network of buyers and collectors who are looking to purchase your pre-owned luxury watches at the highest market value. Not only will you be provided with great proposals and high bids for your watch, but you will also receive fantastic benefits and services from Worthy’s team of experts, including independent evaluators who offer decades of experience that allows us to provide you with the most accurate evaluation of your luxury watch as well as the highest market value available. Why Sell My Omega Watch With Worthy? Worthy is internationally renowned and respected as a leading expert in pre-owned luxury watches as well as being the friendliest online buyer’s network around. We offer an understanding of the market and current trends that most other online competitors simply cannot compete with. Our services cater to both watch expert buyers and sellers who regularly seek advice and guidance from the Worthy team. Worthy is certified with a Secondhand Dealers License issued by the New York Office of Consumer Affairs. And since we are not the ultimate buyer of your item, our Omega watch evaluations are completely unbiased. The purpose of our evaluations is to present your Omega watch in the fairest, most transparent way to our trusted buyers network. If you choose to sell Omega watches with Worthy, it will be fully insured from the moment it leaves your side. Your watch will stay insured throughout the entire process of shipment, evaluation, and auction. Reserve Price. The experts at CentralWatch will examine your Omega and compose a detailed report on it. We then take HD photographs of your watch to display at auction. At this stage, you are given the opportunity to set a minimum reserve price. Omega is one of the leading luxury watch brands in the world. These Swiss watches have become an important part of history, being the first watch on the moon in 1969 and used by the British and American armies from as far back as 1917. As the official timepieces of the Olympic Games since 1932, it’s easy to see that this brand of luxury watches represents all that is prestigious. 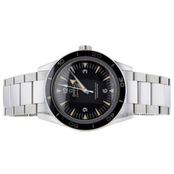 Even James Bond has been wearing Omega in his films since 1995. Click here to listen to our complete Watch Brand Pronunciation Guide and learn how to pronounce Omega correctly. 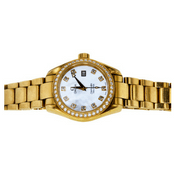 Omega watches are highly sought-after amongst watch buyers. Some popular models include the Constellation, the Omega Seamaster (featured in the James Bond film franchise), the Omega Speedmaster and the Deville. Worthy values watches based on a few important factors, including the condition of the watch, the age of the watch, the rarity and/or popularity of the model, whether or not the original packaging is included, the type of strap and any precious gems or diamonds featured in the watch. Worthy’s team of certified evaluators takes all of this into account when evaluating your watch. If your Omega shows any cosmetic damage such as dents or scratches, the value is likely to drop quite considerably. I Want to Sell My Omega Watch, Where Do I Start? For more insight into Worthy, feel free to read our customer reviews to learn more about the process and hear about how our customers are getting the highest market value for their luxury watches with ease. Submit your watch for an evaluation right now and you could receive cash in just a few days.